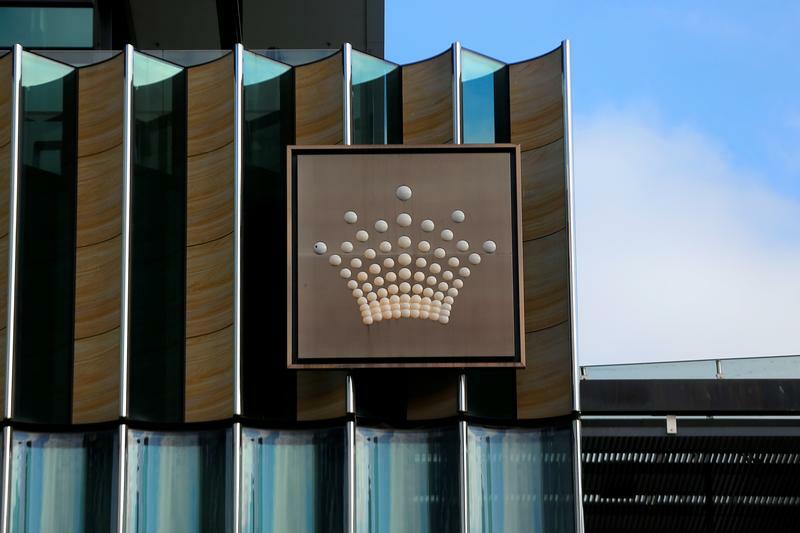 FILE PHOTO: The logo of Australian casino giant Crown Resorts Ltd adorns the hotel and casino complex in Melbourne, Australia, June 13, 2017. Casino operator Wynn Resorts said on April 9 it had called off preliminary talks to buy peer Crown Resorts for A$10 billion ($7.1 billion) after the Australian Financial Review broke news of the negotiations and the subsequent confirmation of offer details by Crown. Crown shares fell about 9 percent on April 10 after shooting up by almost 20 percent a day earlier on news of the potential A$14.75-a-share offer in cash and stock. They were trading at about A$13 apiece in afternoon trading in Sydney on April 12.